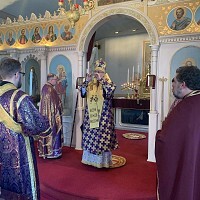 "At Your Baptism in the Jordan, Lord, the Worship of the Trinity was Made Manifest...."
On the eve of the feast-day of Theophany (January 18) Ukrainian Orthodox Christians parishioners from Chicago, IL gathered at St. Volodymyr Ukrainian Orthodox Cathedral to celebrate the traditional Theophany Eve. This event is part of Theophany/Epiphany celebrations by Orthodox Christians around the world and this year it was liturgically served and observed by the clergy and faithful of the cathedral with His Eminence Archbishop Daniel leading the services of the day. The Saturday morning, January 19th, was truly a winter day in Chicago and Mid-West. About 6 inches of snow covered the streets of the major city of the Mid-West; however, the weather conditions did not stop the faithful of the Church to attend the liturgical celebrations of the Great Fest of Theophany. In fact, the weather conditions provided another spiritual impulse, uniting the faithful with their bishop, who recently returned from Ukraine, in order to share together in the Holy mystery of Eucharist and to refresh themselves with the newly blessed and sanctified water for the feast of Jordan, as it is commonly called among the faithful. Archbishop Daniel led the celebration of the Divine Liturgy, with Very Rev. Fr. Ivan Lymar (pastor of St. Volodymyr Cathedral) and Protodeacon Andriy Fronchak concelebrating. 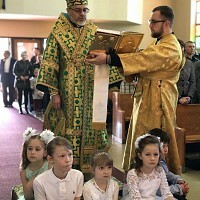 About a dozen of altar servers, headed by seminarian Subdeacon Ivan Venhryn of St. Sophia Ukrainian Orthodox Theological Seminary (South Bound Brook, NJ) provided liturgical assistance during the liturgical service. In his sermon Vladyka Daniel reflected on the feast of Theophany, explaining to the faithful that Christ’s baptism in the Jordan was “theophany,” a manifestation of God to the world, because it was the beginning of our Lord’s public ministry. It was also a “theophany” in that the world was granted a revelation of the Holy Trinity. All three Persons were made manifest together: the Father testified from on high to the divine Sonship of Jesus; the Son received His Father’s testimony; and the Spirit was seen in the form of a dove, descending from the Father and resting upon the Son. The theme of “manifestation” or “revelation” is also expressed in Scripture with the symbolism of light. In the hymn of the Feast we sing, “Christ has appeared and enlightened the world.” Thus, January 19th is also known as the Feast of Lights. 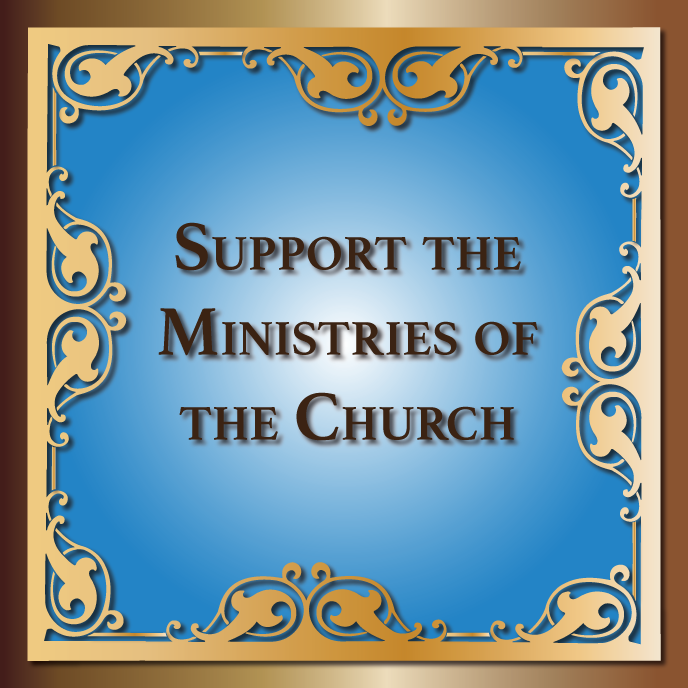 The Church celebrates on this day the illumination of the world by the light of Christ. Following the Divine Liturgy, the bishop, assisted by Fr. Ivan Lymar, pastor of the cathedral parish family and Protodeacon Andriy Fronchak blessed the water. The Great Blessing of Water is perhaps the most memorable part of the Theophany services. Water, as a symbol of purification and cleansing connected explicitly with the blessing of the Jordan River, which occurred at the baptism of the Lord. Upon the conclusion of the Divine Services, Archbishop Daniel, on behalf of the Council of Bishops of the Ukrainian Orthodox Church of the USA presented three Centennial awards – Medals of St. Andrew the First-Called Apostle to the following individuals, who examined exemplary dedication to the ministry and service of the Ukrainian Orthodox Church of the USA: Mrs. Mariya Hlibka (parish board president of St. Volodymyr Cathedral); Maestro Wolodymyr Popowych (long-time “Boyan” choir director of St. Volodymyr Cathedral) and Ms. Olena Lymar (secretary of the cathedral parish board of administration and leader (as well as a participant) of various charitable projects in the life of the cathedral community and the greater UOC of the USA. Following the liturgical services and presentations, the archbishop, clergy and faithful in attendance shared in a meal, prepared by the Cathedral’s St. Olha Sisterhood. During the luncheon, which was attended by over a hundred individuals, Archbishop Daniel made a short presentation about the most important historic event in the life of the Holy Orthodox Church of Ukraine – the granting of Tomos of Autocephaly to the Orthodox Church of Ukraine. In August of 2018, Vladyka Daniel was appointed as the Exarch of His All-Holiness Ecumenical Patriarch Bartholomew I to Ukraine on order to facilitate, along with bishop Ilarion of the Ukrainian Orthodox Church of Canada, the process of unification of various Orthodox jurisdictions in Ukraine. In his remarks, the archbishop reflected upon the importance of the historic event and the need for a greater Orthodox unity among the Orthodox faithful in Ukraine, especially in the time of spiritual awakening following the turbulent years of Communist dominion over ancestral homeland Ukraine - home of thousands upon thousands of Ukrainian Orthodox Christians of the Ukrainian Orthodox Church of the USA. Following his presentation, representatives of various Ukrainian community organizations of Chicago, IL greeted the archbishop. Among them were several representatives of the local Chicago chapter of Ukrainian-American Veterans (an organization to which archbishop Daniel belongs as well, following his service in the US Army Chaplain Corps), who presented Vladyka Daniel with a commemorative UAV Coin award for his dedication and service in the Holy Ukrainian Orthodox Church of the USA and monumental efforts and assistance in the process of unification of the Orthodox Church of Ukraine. January 20, 2019. As the early hours of Sunday morning arrived, the Feast of the Synaxis of Holy Prophet and Baptizer John, the faithful of the parish family gathered around the Church to welcome their bishop. The pastor of the parish community, Fr. Ivan Lymar, along with the members of the parish board of administration, members of the choir, parish’s sisterhood - formally welcomed the hierarch, presenting his with flowers from the children, bread and salt from the community and a hand cross for veneration from the pastor of the parish. The feeling of festal joy was uplifting as the hymns of Theophany were sung in the candlelit church; as His Eminence blessed the temple and parishioners prayerfully greeted their archpastor and drank deeply of the newly-blessed waters. All appreciated the time Vladyka spent with the parish, manifesting the episcopal ministry through his prayer, teaching, encouragement, and fellowship, and especially on this, the Great Feast of Theophany.